Kakegawa castle (掛川城) is located at a small hill in the center of Kakegawa city, a posting town of Tokaido way. Kakegawa area is a flat area of about 4 kilometer long and 2 kilometer wide, just at the west of Sayo-no-Nakayama pass which was one of major pass of Tokaido road. 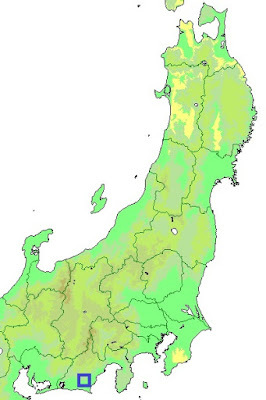 Because of its geographical condition, Kakegawa area had been an strategic point in east half of Totomi province (western half of Shizuoka prefecture). Originally in the mid of 15th century Imagawa clan, a warlord of Suruga province (eastern half of Shizuoka prefecture), ordered his vassal Asahina clan to build a castle in this area. The first castle was located a little north of this castle, but in early 16th century new castle was constructed in this place. Asashina clan worked as a important retainer of Imagawa clan, and Kakegawa castle was a base of Imagawa clan at Totomi province. In 1560, Yoshimoto Imagawa (1519-1560), the leader of Imagawa clan, was defeated and killed at the battle of Okehazama against Nobunaga Oda (1534-1582), a warlord of Owari province (western half of Aichi prefecture). His son Ujizane Imagawa (1538-1615) struggled to keep the house, but in addition to the revolt of retainers, weakened Imagawa clan was attacked by both of former ally Shingen Takeda (1521-1573), a warlord of Kai country (Yamanashi prefecture) and former subordinate Ieyasu Tokugawa (1543-1616), a warlord of Mikawa province (east half of Aichi prefecture). In 1568, Shingen Takeda invaded to Suruga province, and due to betrayal of retainers Ujizane could not resist against Shingen and left its capital Sunpu city. Ujizana escaped to Kakegawa castle still kept by Yasutomo Asahina (1538-?). At the same time Ieyasu invaded into Totomi province and surrounded Kakegawa castle, but this stood five months against the attack. Finally Ujizane opened the castle in 1569, and at the point of this surrender Imagawa clan substantially ruined as a warlord. Tokugawa clan held this castle about 10 years and used Kakegawa castle as an important base of eastern Totomi province. Shingen Takeda next aimed to Totomi province and Tokugawa clan faced the struggle over 5 years against dominant Takeda army, and lost Futamata castle or Takatenjin castle. But Kakegawa castle which was kept by Ienari Ishikawa (1534-1609), an hereditary retainer of Ieyasu, survived pressure from Takeda army until the extinction of Takeda clan in 1582. After the Odawara campaign performed by central ruler Hideyoshi Toyotomi (1537-1598) in 1590, Ieyasu was transferred to Kanto region. Kazutoyo Yamauchi (1545-1605), an old retainer of Hideyoshi and who was famous for having wise wife, was appointed as a commander of Kakegawa castle and moved from Nagahama Castle (Shiga prefecture). As an important base at Tokaido way, Kazutoyo improved Kakegawa Castle into a modern one and built main tower in 1590's. During his period outer barrier surround the castle and castle town was also built, and the total size of the castle became two kilometer long and one kilometer wide. Kazutoyo Yamauchi was born as son of a retainer of Iwakara Oda clan, a vice governor of south-half Owari province (western Aichi prefecture). But Iwakura Oda clan was extincted by Nobunaga Oda, and Kazutoyo had to wander here and there. Several years after Kazutoyo became a retainer of Nobunaga and was attached to Toyotomi army. At this point Kazutoyo also married with his wife, named Chiyo. One day there was a large military parade in Kyoto, and Kazutoyo was ordered to attend as a part of cavalry. His horse was shabby, but Chiyo bought a good looking horse to appeal Kazutoyo, by her secret saved money brought at marriage and kept for future important use. Riding good horse Kazutoyo could gain his honor. This story is said as "Naijo no Ko" (achievement of helping partner), and treated in textbooks before WW2. After the battle of Sekigahara in 1600, Kazutoyo moved to Tosa province (Kochi prefecture) and built Kochi castle. During Edo era this castle was thought important as it controlled Tokaido way, and hereditary lords of Tokugawa clan managed this castle. At the end of Edo era, in 1854, a serious earthquake occurred in this area. Many building including main tower were lost, and only secondary area palace was rebuilt due to necessity. Subsequent to Meiji revolution, secondary area palace just after rebuilt was continuously used as a public office and remains till now, and main gate was transferred to Yusanji temple (Fukuroi city). In addition to this, in 1994, main tower was rebuilt in old wooden style, referring the one of Kochi Castle also built by Kazutoyo Yamauchi. 15 minutes walk from JR Central Tokaido Shinkansen line / Tokaido line Kakegawa station. 15 minutes drive from Tomei Expressway Kakegawa interchange.